Located on Dubai’s newest island oasis, Caesars Bluewaters Dubai is the first ever non-gaming resort from the legendary Caesars brand. Unlike anything the Middle East has seen before, guests can expect a truly immersive encounter with a hotel group known around the globe for its fun approach to luxury. In a city full of promises, Caesars Bluewaters Dubai has one – every guest will live like a Caesar from the moment they step through the doors. Debuting in Dubai for the first time is the unique lyashi Dome, a treatment device exclusive to Qua Spa at Caesars Palace Bluewaters Dubai. Inspired by traditional Japanese practice, ‘Suna Ryoho’ – where the locals bury themselves in the sand near hot springs on the beach to eliminate toxins – it uses cutting-edge technology to deeply cleanse the body, restore its balance and gain efficient and long-lasting slimming effects. Lasting 30-60 minutes, the patented Black Carbon technology stimulates the body with long-wave infrared rays eliminating up to 1200ml of water and unwanted toxins, burning up to 600 calories per session. Positive side effects such as weight loss and the reduction of cellulite, improvement of the skin quality and anti-aging – make it a must try for wellness connoisseurs looking for a serious detox. The spa boasts eight treatment rooms including two rooms for couples, signature facial and massage treatments, relaxation lounge and male and female facilities with rock saunas, aroma steam rooms, experience showers and ice fountains. The Psammo Concept Quartz Bed is a tension-busting modern sand therapy in a luxury setting. Based on hot sand therapy originally used in Ancient Egypt to treat medical ailments, Qua Spa’s ground-breaking Psammo Concept Quartz Bed is derived from the age-old concept of thermal therapy for mental and physical relaxation. Created by The Gharieni Group, the quartz sand bed treatment offers spa goers the chance to experience something truly special. Integrating the multiple benefits of sand therapy, aromatherapy, inversion therapy and wave-like massage – this is the ultimate in luxury in a city well versed in five-star treatments. 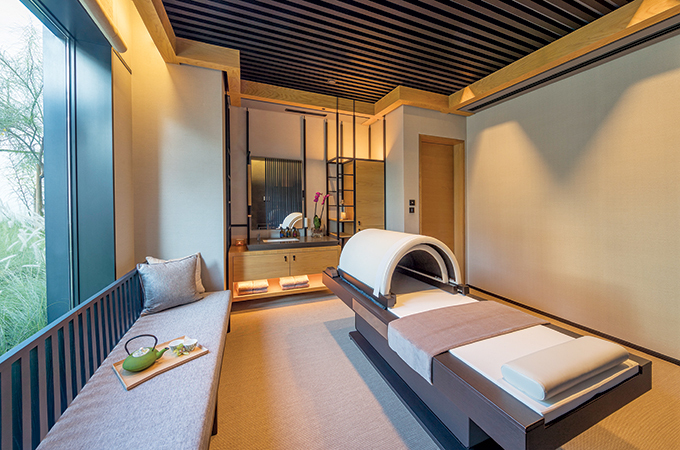 Available as a standalone treatment, or integrated into a number of stimulating body therapies ranging from hot stones, singing bowls, wrapping treatments and exfoliating scrubs, Qua Spa guests can design their own quartz bed experience. Once reclined, sand contours the body alleviating any discomfort by creating a cocoon effect and surrounding the limbs with a warm heat at optimal temperature to impart the full benefits. One session lasts for 60 minutes in the Warm Quartz Bed followed by a 30-minute Body Herbal Compress and Body Massage combined with Arabian Herbal compress of Frankincense and Cedar wood massage and applications of a spicy muscle balm to melt physical and emotional tension. Another signature of Qua Spa is its partnership with British beauty pioneer Carol Joy London, whose quest for ageless beauty has made her a firm favourite with the world’s experts in facial wellness. Known for discovering the potent power of combining clinically proven Pure Triple-Action Collagen and Refined Golden Millet Oil to achieve instant and transformational results, Carol Joy London products are used at Qua Spa for all facial treatments.